BAE Systems Tempest was announced at last weeks Farnborough Air Show, has this sparked a possible merger with Airbus and BAE Systems Fighter Jets? Well we mention this all in this weeks Thursday Thoughts. This week we have recorded Thursday Thoughts as Mike has a root canal appointment at the local dentist right at 5PM, when we usually Go Live with TDW! Who else makes the top ten news items this week? Adobe announces Version 5 of the Adobe PDF Print Engine, SDL partners with Donnelley Language Solutions, Viking assigns data conversion work to ATP and India tops the data-breach league when it comes to data protection. The troubled Howitzer project is placed on hold, it seems a weld is causing the troubled project to continue to have deep problems. Did a firing mechanism failure cause the death of tank operators due to a missing part? Block Chains is making headway in aerospace, but why is it being considered only for parts distribution? Mike asks the question of a sensible and appropriate use of Block Chain throwing down the challenge to technology vendors out there to develop something that the market desperately needs. Liebherr Aerospace accessing the Airbus Skywise system opens up the opportunity to access analytical data that they have never had access to before. 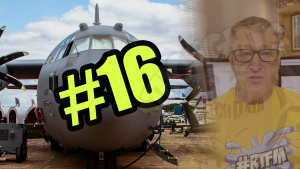 The BAE Systems Trilogi team sponsor this years TDW-Live, the latest TDW Podcast is now available, discussing QR codes (from the banks of the River Great Ouse) and our day-trip out to the Farnborough Air Show video is now available online, can you spot your company? Can you help us source Technical Authors? Can you help us set-up an S1000D capability? When will the Technical Communication in aerospace, defence and space course formally start?